LAS VEGAS — Amid a sea of gadgets, drones, robots and virtual reality demos, commercial trucking carved out a significant niche for itself here at the Consumer Electronics Show, the world’s largest technology event. Electric powered and automated trucks provided attendees with glimpses at the potential future of trucking and highlighted the industry as a hotbed for innovation. The Jan. 8-11 show was expected to attract more than 180,000 technology and business professionals working in virtually every facet of technology, according to the Consumer Technology Association, which organizes the massive event. While CES is best known as a showcase for consumer and automotive technologies, truck manufacturers and startups alike now are using the event as a launching pad for their latest advances. Paccar Inc., the parent of Peterbilt Motors Co. and Kenworth Truck Co., exhibited at CES for the second straight year with an outdoor showcase in front of the Las Vegas Convention Center. This year’s exhibit featured a pair of battery-electric Peterbilt models and a hydrogen-electric truck from Kenworth and Toyota. Kyle Quinn, Paccar’s chief technology officer, described CES as an ideal venue to show the broader public some of the major changes coming to the trucking industry, namely electrification, automation and connectivity. “We’ve been telling our story for many years that Paccar is a technology company that just happens to be in the truck manufacturing business, so what better place for us to really showcase our wares than at CES,” he said. Autonomous truck startup TuSimple also returned to CES, where it offered demonstrations of the sensors and machine vision behind its self-driving technology and announced plans to expand its U.S. fleet to 40 trucks by June. “CES is becoming an important venue for automotive and trucking because while it’s billed as consumer, it’s really a technology show, and trucks are getting more and more technology embedded in them. They are becoming the next technology focus,” said Chuck Price, vice president of product at TuSimple. Paccar Inc. showcases two battery-electric trucks and a hydrogen-electric model in front of the Las Vegas Convention Center at CES. In the days leading up to CES, Daimler Trucks North America announced it would begin offering lane-keeping assist with automated steering capabilities and let industry press test drive its new battery electric models at an off-site event in Las Vegas. Martin Daum, CEO of Daimler’s global truck business, said the company feels an obligation to innovate. As automated driving technology advances, North America is poised to be at the center of it. Apart from exhibiting their products, trucking industry executives and professionals also come to CES to see the show and arrange meetings. Trevor Milton, founder and CEO of Nikola Motor Co., which is developing hydrogen-electric Class 8 trucks for the United States and European markets — and the needed fueling infrastructure — was paying his 15th visit to CES, and paying particular attention to innovative things. “We don’t exhibit. Usually, I am in meetings all the time, walk the floors and see everything,” he told Transport Topics. Milton said one of his favorite exhibits this year was the Nexus electric and hybrid-electric “flying taxi” with vertical takeoff and landing from Bell, formerly called Bell Helicopter. “That’s because I am a pilot. I love to fly. Flying is my yoga, or my zen,” said Milton, who pilots a Cessna 206 Station Air Turbo plane. 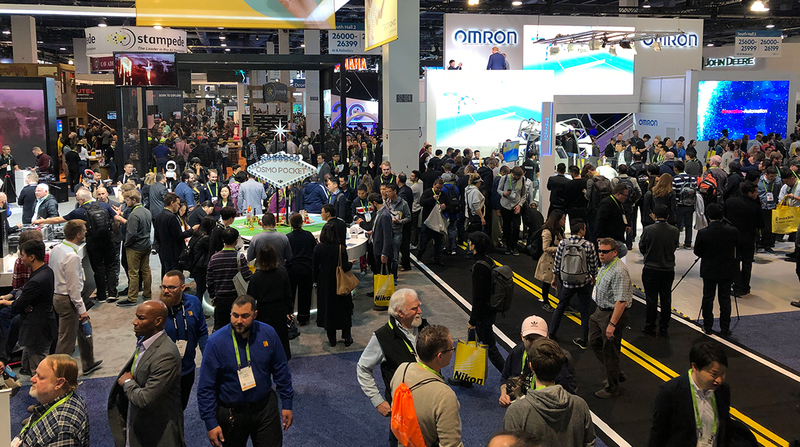 While exhibitors showcased their innovations and attendees gathered ideas at CES, the partial shutdown of the federal government over border wall funding affected portions of the conference programming. Several government officials, including U.S. Transportation Secretary Elaine Chao, reportedly canceled planned appearances at CES amid the shutdown.